When planning upgrades to your network, remember the old adage: One person’s trash is another one’s treasure. Don’t miss out on an opportunity to pad the IT budget by assuming that your equipment is obsolete. 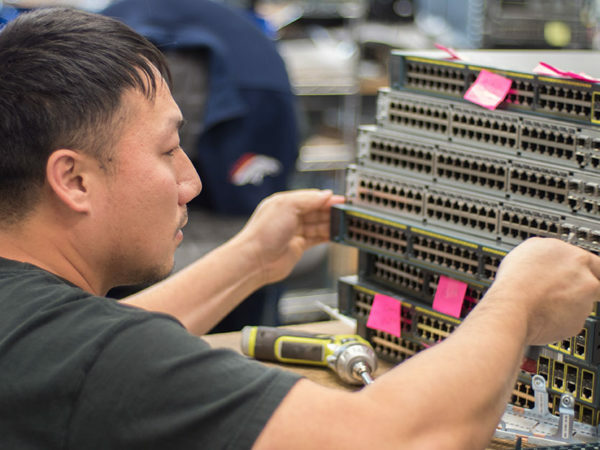 Even if your business has outgrown its old networking equipment, there’s a good chance that it still has resale value. Today we offer a few tips for getting your old equipment ready to sell. Backup and remove old data: We know we’re stating the obvious, but we’d be remiss if we didn’t include a reminder to backup any data that you still need before doing anything else. This includes anything that you use in current operations, as well as data stores you might need for future audits, etc. Wipe (or destroy) the hard drive: Simply deleting old information from a hard disk drive means that it can still be recoverable. You’ll need to use a software program to wipe the HDD and ensure that the old data is inaccessible to the next user. If the drive contains particularly sensitive data, your safest path will be to destroy the drive altogether. Restore factory settings: Restoring the device to factory settings will also help ensure removal of old data, as well as speed up performance for better resell value. Pack and insure for shipping: Specialty packaging for electronics is available from major shippers. It’s highly recommended that you take advantage of this to avoid damage to incorrectly packed equipment. Avoid styrofoam padding, which can easily flake; if tiny pieces of styrofoam get into the cracks of your equipment, it could also become damaged and unusable. If you’re insuring the equipment with the shipper, make sure that it covers the full value. Some insurance pays by weight, which will be inadequate. An advantage of selling your old equipment to Summit is that we’ll help you take care of the logistics. For large volumes of equipment, we can arrange for pickup for you. For smaller volumes, we’ll cover the transportation costs for ground shipping. Summit thoroughly audits and tests all equipment before it’s re-sold, protecting both sellers and buyers. You have the option of receiving a check or a credit towards equipment purchases that you can use immediately or in the future. Ready to find out how much your old equipment is worth? Contact us now. If you’ve already decided to sell your old equipment, see our video guide on packaging and shipping.